9. The Market Place (Markedspladsen). From 1868 until 1960 this pretty park area in Herning was the home of many livestock shows. Farmers from the area would bring their livestock to be traded or sold. 10. Herning Clothing Plant (Herning Klædefabrik). This Wool Spinning Mill was founded in 1876. The Clothing Plant has many exhibits which show the history and importance of textiles in the region, including a number of functioning traditional workshops. The main building of the plant holds The Textile Forum Museum (Muset Textilforum). This museum displays a number of old looms and other traditional machinery which was used to produce textiles through the ages. Both museum are well worth a visit for visitors to Herning. 11. Norre Alle (Nørre Allé). Norre Alle is a famous street in Herning Danmark. Located on this street are a large huge number of high-end architectural homes. Special mention goes to I.C. Rønnows house (number 8) which was built in 1900. 12. The Childhood home of Nis Petersen (Nis Petersens Barndomshjem). Nis Petersen (1897-1943) is one of Denmark’s most famous authors and poets. Petersen never achieve much success outside of Danmark. Nis Petersen was cousins with the famous Danish priest and playwright Kaj Munk (1898-1944). Kaj Munk was executed by the Gestapo for his very open attacks on the Nazis during the German occupation of Denmark during World War 2. Nis Petersen’s house is located on Nygade 14 and was built in 1905. 13. The Square (Torvet). 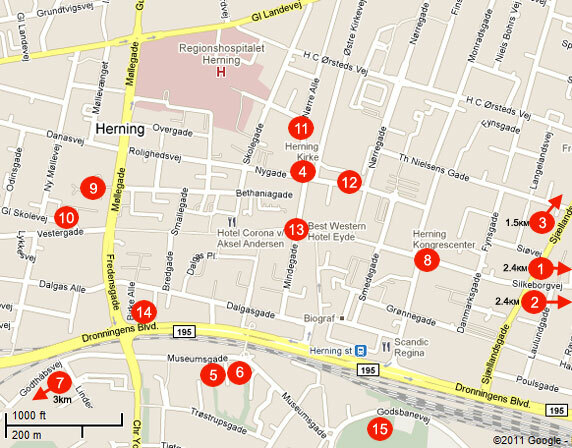 Located on the corner of Torvet and Bredgade is the main square in Herning. In the square there is a beautiful building from 1912. Today the building belongs to a Danish Bank called, “Hedebanken”. Another fine building in the square is the Hotel Eydes which was built in 1893. Accross from the Hotel Eydes stands a beautiful sculpture called, “The Sitting Lady” (Siddende Dame). The sculpture was created by world famous British sculptor Henry Moore (1898-1986). 14. Hosebinderlaugets House (Hosebinderlaugets Hus). The house was built in 1919 and was originally intended as a horse stable and a place to chop hay into smaller pieces so that it could be put into feedbags for the horses. However, in 1920 the building was rented out to the clothing manufactures who were in desperate need of more space to meet the growing textile industry. The building is called the ‘cradle of the textile industry’ (Tekstilindustriens vugge) because of the many great Danish clothing designers and manufactures who began their career in this building. 15. Sondre Anlaeg (Søndre Anlæg). Sondre Anlaeg is a nice city park with a great atmosphere. The park is very accessible to central Herning. The park was designed by Enroco M. Dalgas (1828-1894), and landscaped in 1897. The park is a nice place to enjoy an afternoon.